Hureen Saghar Gandhi lives with her husband and their two wonderful daughters in Northern Virginia. She savors her ever-growing collection of memories from her travel escapades and meeting people all around the world. Her passion lies in capturing the moments (that may get lost in time) through her camera lens. And recently through her writing, she humorously brings to life her fond memories. Page 6 and Beyond: Let’s Stir the Pot... is a glimpse at the power of social media to bring a disparate group of people together who happened to share an experience some twenty years earlier. Author Hureen Saghar Gandhi was born and raised in India, but as did many of her classmates from those schooldays, she moved halfway across the world and now resides in Northern Virginia, USA. After an impromptu school reunion with some of her classmates from back in India, they decide to set up a “WhatsApp” group to try to bring everyone back together and reminisce over their long forgotten schooldays and the adventures and aspirations they all had then. Gandhi is excited to see where all her old friends have ended up and what they are doing now. Set against the social upheaval and acrimony of the 2016 Presidential elections, the author, a staunch Hillary Clinton supporter, is dismayed to find one of her old friends is a staunch Trump supporter. The tensions and humour of reconnecting after all these years is the thread that ties this story together. 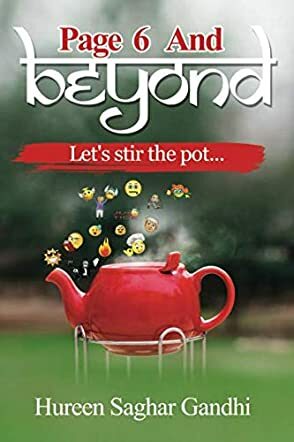 What Page 6 and Beyond: Let’s Stir the Pot... does well is remind us of the power of social media today to reunite friends from the past. Despite all the qualms about privacy and bullying, there is good to be had from this ability to reconnect. Having seen this myself, with my own wife reconnecting after forty years with her high school classmates, this story definitely resonated with me. Hureen Saghar Gandhi has done a good job in controlling what, at times, had the potential to be both explosive and privacy invading. Perhaps the biggest disappointment for me, as a reader, is that the emojis, which play such a critical part in the humour of these stories, did not reproduce well in the Kindle version of the story. Consequently, some of the humour passed me by. That having been said, there were plenty of anecdotes from the author’s schooldays which had me chuckling away to myself and reminiscing over my own schooldays. This is a fun little read that is full of the warmth and humour of true life experience.